This is a documentary executive produced by the members of Green Day, narrated by Iggy Pop, chronicling the scene in which Green Day, Rancid, and others came up in. Sounds like an amazing journey. Well, you’d be about half right. While this film is somewhat definitive and tells the story in only a way that punk rockers could tell, it feels like a hefty hardback book. At over two-and a-half hours, it pushes the patience of even the most diehard Green Day or punk follower. But it does get a number of things right while going in circles to do so. 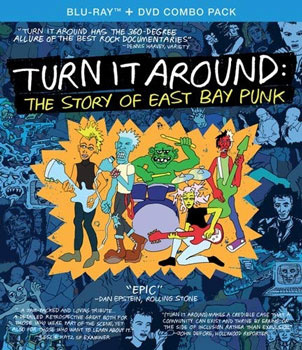 Filled with interviews with members of Operation Ivy, Green Day, Crimpshrine, and others that never made it into the mainstream, alongside pioneers like Penelope Houston of the Avengers, Jello Biafra, and members of Flipper, you get the story of every nook and cranny of the scene that stretched out from San Francisco, Oakland and other surrounding cities. To some, it might be overkill, but it’s like reading a book about the scene with interviews and pictures. The live footage of various bands is the lynchpin of the film, as it shows the bands like Op Ivy and Green Day in the early stages, finding their sounds and eventually showing off what they became – essentially the kings of the scene. The film shines a light on the political aspirations of several bands, the female-led bands and the feminist movement coming into the scene. That’s been quite an interesting aspect of the film. Several aspects weren’t necessary, such as several musicians talking about how they were never in it for the money, they didn’t care about success, all that racket. I’ve always felt that aside for a few bands, every band wants a bit of success, to be known on a bigger scale, so ideals like that feel more at place in a book. One thing I felt was missing was a drug influence that may have creeped into the scene. The singer for Fang went to prison for over a decade for murdering his girlfriend while high on heroin! That feels like it’s definitely worth mentioning somehow. Overall, it feels like you should be reading a giant coffee table size book about the scene instead of watching a film. I felt that the premise and the approach were good and worthwhile, but some decent editing would have made for a more concise, precise package.